Providers are researching new product innovations combining security of income from an annuity with the access to capital with a flexi-access drawdown account offering flexibility for people retiring. Since the March 2014 Budget the Chancellor George Osborne made radical changes to the way people can take their benefits. It is now no longer necessary to buy a pension annuity. From April 2015 it will be possible to take the maximum tax free lump sum and the remaining fund as cash less tax at your marginal rate. However, people will still have the problem of providing a reasonable income from their fund and for a 65 year old an annuity can offer 6% per annum. In the saving market outside of pensions the income is closer to 3%. New products are being researched that would allow an annuity and a flexi-access drawdown account in one plan giving the opportunity for part of the capital in the fund to be accessed at any time. For people buying a lifetime annuity today they would have to give away their fund to an insurance company in return for an income and loose their right to access capital. Innovative new products would offer the greatest flexibility at retirement and could end the lifetime annuity as it is today. These products could allow 100% of the fund to be in an annuity, a flexi-access drawdown account or any combination between as well as contributions to be made to the fund. There would also be an option to convert the annuity back to the flexi-access drawdown account and to access the capital as cash or even make a contribution to top-up the plan. 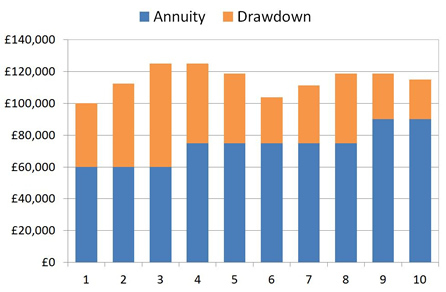 The following chart shows how the pension fund could change over a ten year period between an annuity and flexi-access drawdown account. There are advantages of being able to access capital from a pension fund in the future. The capital could be used to help children or grandchildren with a deposit on a property, a holiday, home improvements, purchase a new car or even to fund a medical emergency such as an operation not covered by the NHS.  Years 2 and 3 - Contribute two further £12,500 gross (after tax relief) a year to the fund based on earned income.  Year 4 - Add additional annuity income with £15,000 of the fund after annuity rates rise with higher interest rates.  Year 5 - Take £6,250 tax free lump sum from the earlier contributions.  Year 6 - Take £15,000 as a single withdrawal from the fund to help their child with a deposit for a flat.  Year 7 and 8 - Make two further contributions of £7,500 gross (after tax relief) a year to the fund based on earned income.  Year 9 - Add additional income with £15,000 of the fund after poor health offers an enhanced annuity income.  Year 10 - Take £3,750 tax free lump sum from the earlier contributions. By the end of the 10 years £90,000 has been used for an annuity which could be reversed back to the flexible drawdown account although the amount back would be lower after considering income paid. 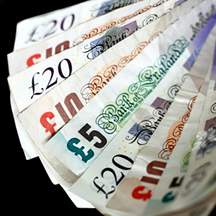 A further £25,000 remains in the flexi-access drawdown account and can be taken out as cash at any time. A further £25,000 has been taken from the fund, £10,000 as a tax free lump sum and £15,000 taxed at the marginal rate. The amount added to the fund was £32,000 before tax relief at basic rate. Providers are considering savings type interest for funds held over short terms of 1, 2 and 3 years offering interest rates of 2%-4% gross. By keeping the funds in the pension environment means the interest will be paid gross, irrespective of your marginal tax rate. For the part of the fund remaining over a longer period of time equity funds can be considered based on an individuals attitude to risk and these can provide higher potential returns over 5 to 10 years. There are also drawdown plans where the equity funds are protected giving a smooth growth return over time as long as the market remains within ranges. This avoids the volatility associated with equities while benefiting from a consistent 6% return over time. To take advantage of these arrangements you will have to avoid buying a existing lifetime annuity where you exchange your fund for an income and would no longer be able to access the capital. It would be possible to consider a fixed term annuity for one year allowing time to benefit the new pension rules. This would provide you an income and a guaranteed maturity amount at the end of the term. The fund could be used to buy an innovative product at that time from any provider in the market. An alternative would be the existing pension drawdown plans that have also been adapted for smaller funds of £30,000 to £100,000 investing in a sterling or protected fund until April 2015. This option would allow greater flexibility than the fixed term plan.